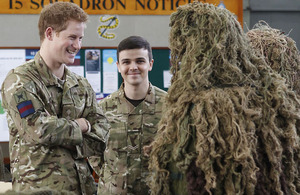 Prince Harry recently visited RAF Honington in Suffolk and met station personnel and their families as well as being shown a selection of the unit's state-of-the-art military equipment. Prince Harry, who has just qualified as a fully-operational Apache attack helicopter pilot after successfully completing 18 months of training and is based nearby at Wattisham, is RAF Honington’s Honorary Air Commandant. During his visit he was shown armoured vehicles, surveillance aids and communication equipment and he also took the opportunity to present a number of awards and a medal. RAF Honington is home to 1, II, 15, 26 and 27 Squadrons of the RAF Regiment, the Defence Chemical Biological Radiological and Nuclear Wing, 2623 Squadron Royal Auxiliary Air Force Regiment, the 1st Royal Tank Regiment and a medical Regional Rehabilitation Unit. It is also home to the RAF Regiment’s Force Headquarters, its Training Wing and the RAF’s Force Protection Centre. It has been an immense honour to have His Royal Highness visit us today. RAF Honington, being the home of the RAF Regiment and broader defence outputs, has a proud story to tell. Our people have been delighted with the opportunity to link up with their Honorary Air Commandant and to share their experiences. He has met a complete cross-section of our community, including the families of those who are on operations, and has spent time with those preparing to deploy. Coinciding with the 70th anniversary of the RAF Regiment, ‘fighting on the ground for control of the air’, this has been a most memorable occasion. It was a great honour, we as a family felt very privileged. It was brilliant that he took the time to see us, I was quite star-struck. It was amazing to meet him, and very exciting to share with my little girl. Prince Harry last visited RAF Honington in July 2010 when he opened a new Junior Ranks dining facility and presented two Elizabeth Crosses.